The Indian markets on Friday jumped most in a month, mirroring a bounce in global equities, as investor sentiment improved after two days of turbulent selling. The risk-off bets eased after the US dollar weakened and China relaxed restrictions on foreign investments. The benchmark Sensex closed at 35,423, up 386 points, or 1.1 per cent, the most since May 31. The rupee rebounded 0.5 per cent, the most since June 2, to end at 68.45 against the dollar. A day earlier, the rupee had touched a lifetime low of 69.09 amid a spike in global crude prices. Finance Minister Piyush Goyal sought to calm the frayed nerves, saying there was no need for any 'knee-jerk reaction' to deal with the fall in the rupee. 'I have full faith that the RBI, which manages foreign exchange and rates, and the government will sit together and discuss. We will take a call on appropriate measures, taking into consideration the global situation,' he said. Brent crude traded around $78 levels, after gaining over 5 per cent during the week. Most global markets traded with gains, with the MSCI Emerging Market Index rising as much as 2 per cent, after the Shanghai Composite Index soared 2.2 per cent. The gains on Friday were broad-based with the NSE Nifty Smallcap 100 and Midcap 100 surging 2.4 per cent and 1.9 per cent, respectively. 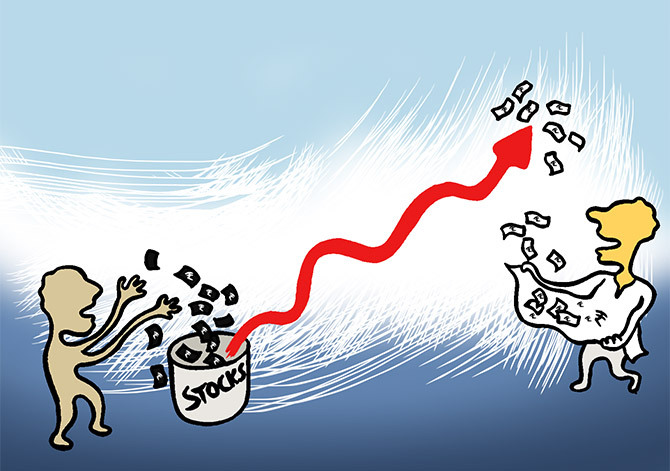 In the preceding four trading sessions, the Smallcap index had plunged 6 per cent and the Midcap index had dropped 4.2 per cent, underperforming the Sensex, which fell 1.8 per cent in the same period. "After multiple days of losses, any relief rally is welcome. However, the trend hasn't changed," said Tirthankar Patnaik, chief strategist and head of research-India, Mizuho Bank. "Oil prices are going up, there could be another rate hike and there is a lot of uncertainty surrounding the global trade war." Trade wars have mauled global markets, with $1.7 trillion of world market capitalisation getting wiped out since June 12. Foreign portfolio investors (sold shares worth Rs 1.57 billion, while domestic institutional investors pumped in Rs 22.6 billion. Recent beaten-down stocks led the advances on Friday. Tata Steel rose 3.6 per cent, most among Sensex stocks, followed by Bajaj Auto, Yes Bank and Reliance Industries, which gained over 3 per cent each. Among the declining stocks were HDFC Bank and IndusInd Bank, which fell over 1 per cent each. The Sensex, an index of 30 large companies, ended the quarter with 7.5 per cent gain, while the Nifty 50 index gained 6 per cent. The Nifty Smallcap and Midcap index, however, ended the quarter with declines of 7.9 per cent and 3.1 per cent, respectively. The rupee declined 5 per cent against the greenback. Experts say the markets are vulnerable to further correction as valuations continue to remain pricey. "Valuations are still expensive with the Sensex trading at nearly 20 times its 12-month forward earnings estimate against the long-term average of 16 times. India's valuation premium to other emerging markets to continues to remain high," said Patnaik. Experts say June quarter earnings growth would be critical for the market performance. Foreign brokerage CLSA is forecasting Nifty earnings to grow 23 per cent in 2018-2019. In the last five years, earnings have grown at annual rate of just 5 per cent. The consensus earnings growth estimate for Nifty this fiscal is 21 per cent. CLSA is projecting a significant margin expansion and earnings growth for sectors and companies such as cement, multiplexes, Zee, Eicher, Hindustan Unilever and TVS Motor. Meanwhile, high base for metal companies and HDFC could drive down earnings, it says.